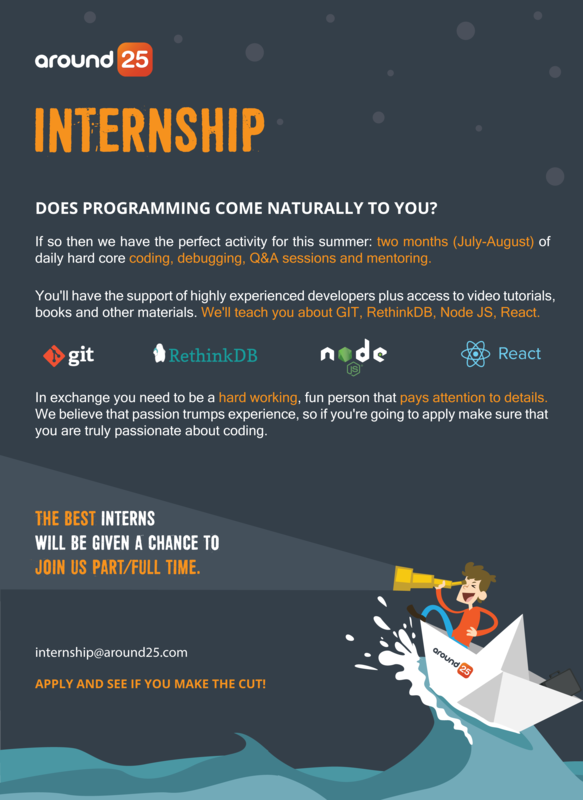 We announced our summer internship on May 12th. Since then, it's been two and a half weeks during which more than one hundred people applied. The majority of you study Computer Science, so you are the future generation of software developers in Cluj-Napoca. The problem is that most applicants are happy with going to school and doing their homework. We have seen CVs which are so similar that only the name, phone number, address and high school are different. Same abilities, same skills, same projects, almost same hobbies. We understand that you all take the same classes and get the same homework at school, but the kind of people we are looking for are able to stand out of the crowd. Please do this exercise: ask five of your colleagues for their CVs and compare them to yours. How similar are they? Too similar? That's the problem, what you do in school is not going to give you the edge. School is supposed to educate the masses. It is your responsibility to go the extra mile. We see more and more students that do volunteer work, which is great and highly appreciated. But if you would apply to become a doctor how important do you think volunteer work is when making life or death decisions? Sure, programming is safe. People don't die if you write a bad line of code. But rockets fall out of the sky, probes crash on Mars, NORAD reports missile attacks and cars kill people. When we open your CV we are looking for diversity, achievements and personal projects (not homework you did for school!). This year we could only select 12 out of 100 for the interviews that are going to take place next week. Remember that your career starts the moment you decide what professional path you want to take in life. Focus, work hard, love programming and you'll find your place. If you want to get an idea about what life at Around25 is like, we're active on Facebook, Twitter and Instagram so come say "hi"! What is a Senior Software Engineer? Honestly, we're still learning, too. But we want to share what we know so far.